Meghalaya footballer found his name in the probables list for U-23 AFC Championship Qualifiers, 2020 to be held in Uzbekistan from March 22 to 26 next. The All India Football Federation (AIFF) on Tuesday announced the probables list for U-23 AFC Championship Qualifiers, 2020 to be held in Uzbekistan from March 22 to 26 next and promising footballer from the State, Samuel Lyngdoh Kynshi has also been included in the list, according to reports. 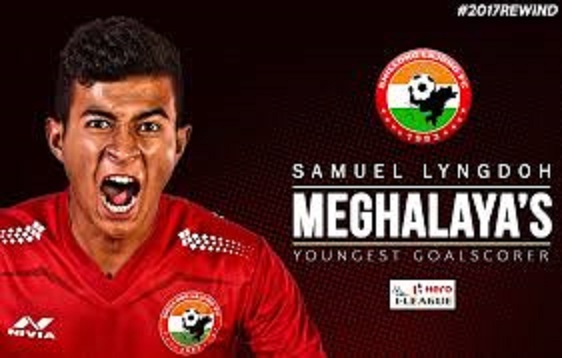 Samuel, who plays as a forward in Shillong Lajong Football Club has been named in the Indian National Team Probable Squad for the AFC U-23 Championship Qualifiers 2020. The 18-year-old youngster who is Meghalaya’s youngest I-League goal scorer is all set to join the Indian National Team preparatory camp in two phases in Goa from March 2 to 8 and then again from March ?16 ?to 19. He will also play an international friendly match against Qatar U-23 national team. India is placed alongside Pakistan, Tajikistan, and Uzbekistan in Group F and the teams will play the AFC U-23 qualifiers in Uzbekistan ?from ?March22 to 26. The AFC U-23 Championship will kick off in the beginning of the year 2020. The Shillong Lajong Academy product, Samuel is currently playing in the ongoing I-League and is also the joint second highest Indian goal scorer of this season with four goals.